Moncton is the perfect hub to start your exploration of New Brunswick. This city is only province that is officially bilingual in French and English (Quebec is unilingual). Check out some unique natural features, fun local shops and good eats. The Crowne Plaza is a good place to base yourself in the city. 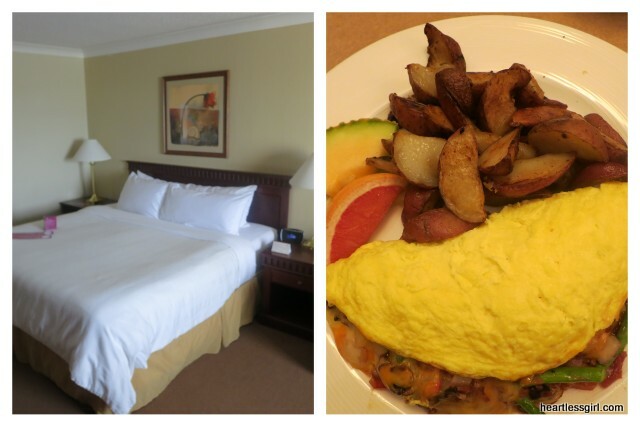 The comfortable hotel is a short walk away from downtown shops and has a delicious breakfast buffet that includes fish cakes! Yum. 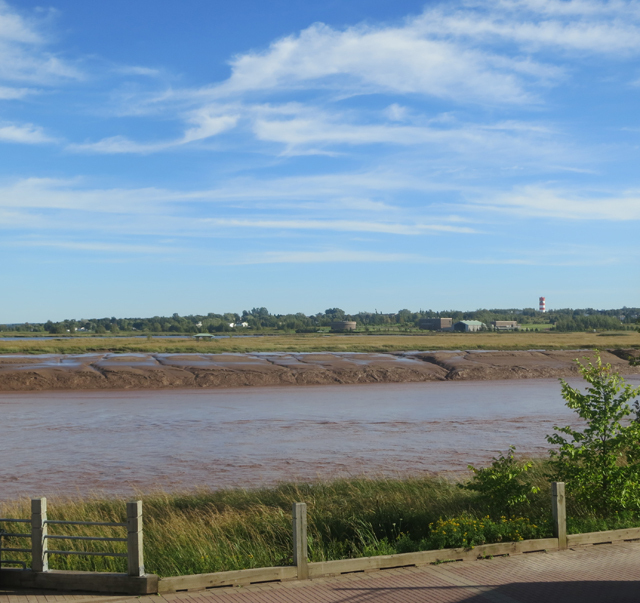 Tidal Bore: Take a walk downtown and peek at the Petitcodiac River, or what the locals call the chocolate river due to the mud bottom that’s often visible. This river is home to a natural phenomena called the Tidal Bore. 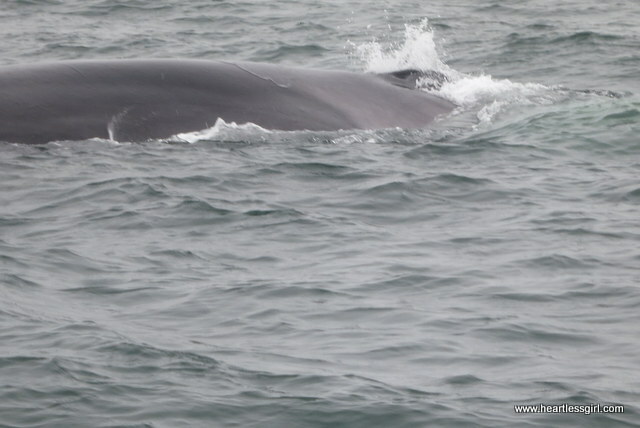 This is an after effect from the nearby Bay of Fundy. The higher waters in the bay cause the water in the river to roll backwards in a single wave, which can be up to 24 inches tall! The tide rolls through the river twice a day. 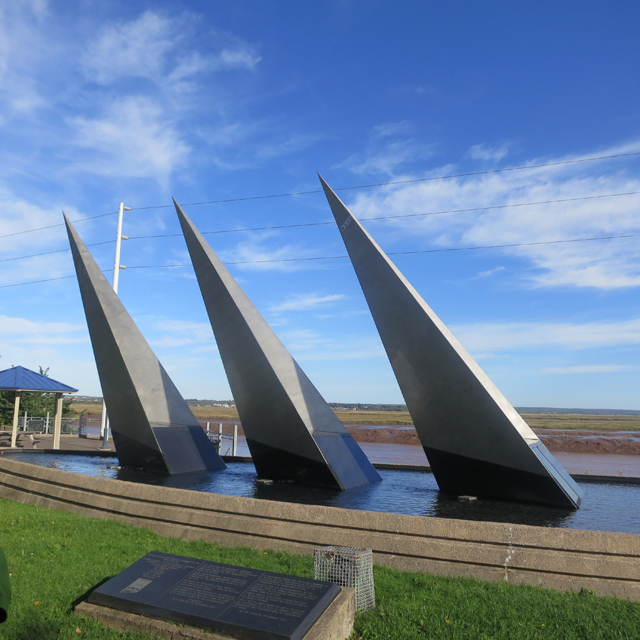 The tidal bore has been getting some attention lately from the surfing community. This wave is perfect for surfing, and is the longest wave. Visitors are starting to recognize this and have come from around the world surf this wonder. Surfers from California even broke a record! Magnetic Hill: Head up the hill backwards in this natural phenomenon turned fun tourist attraction. 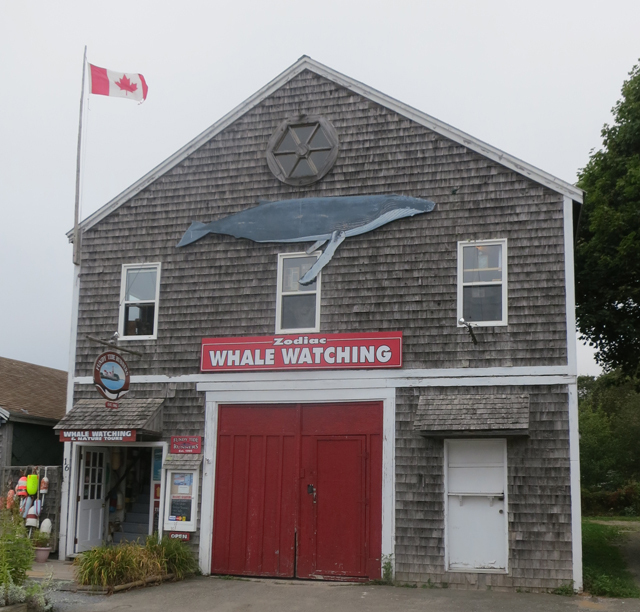 With a nearby zoo and wharf, this can be the perfect spot to spend the day. Magnetic Hill Winery: These delicious wines are made from handpicked fruits. Take a tour, sample some wine for free or buy a custom packed picnic basket to enjoy on the beautiful grounds. Grab a one of a kind hand-painted porcelain souvenir or cup from this tiny French shop. 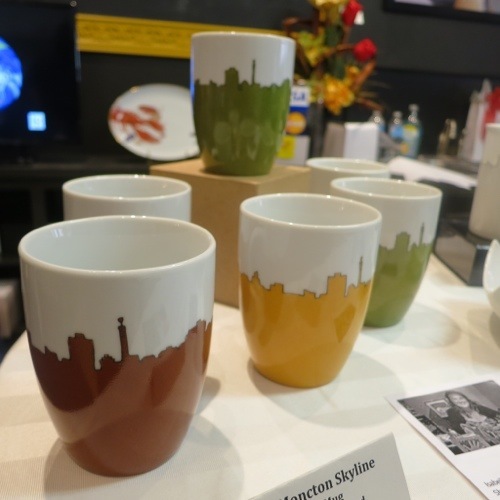 Bonus: Pick out one of their Moncton skyline mugs for the perfect gift. 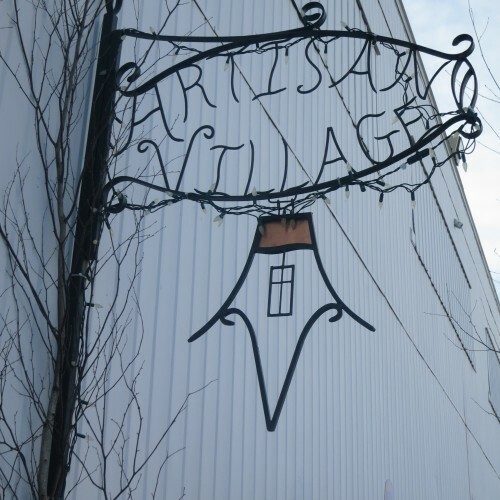 Visit the Artisan Village downtown to explore a 8,000 square feet space of art galleries, studio spaces and unique items to buy. Tide and Bore (see what they did there? Tidal bore?) serves up tasty fare in their Gastropub downtown. Craving seafood? Check out Catch 22. 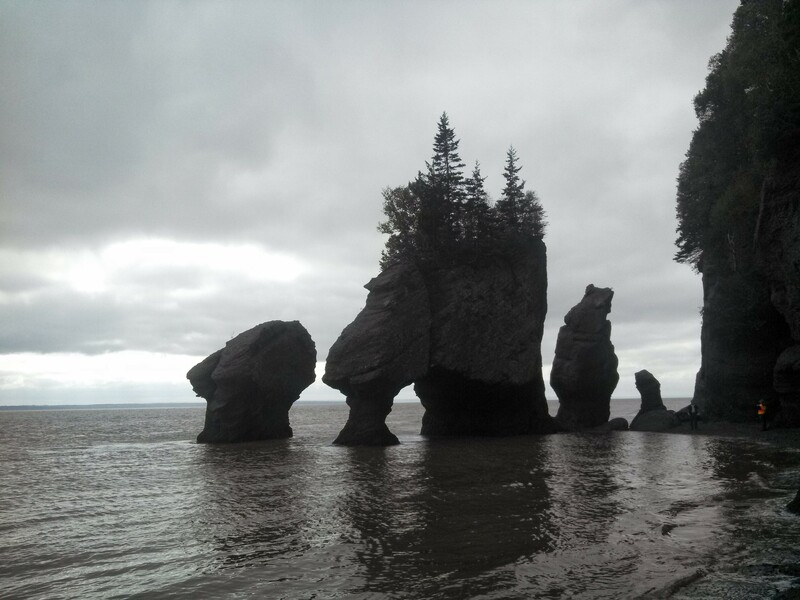 The Hopewell Rocks are magnificent, and a must see when in Moncton. 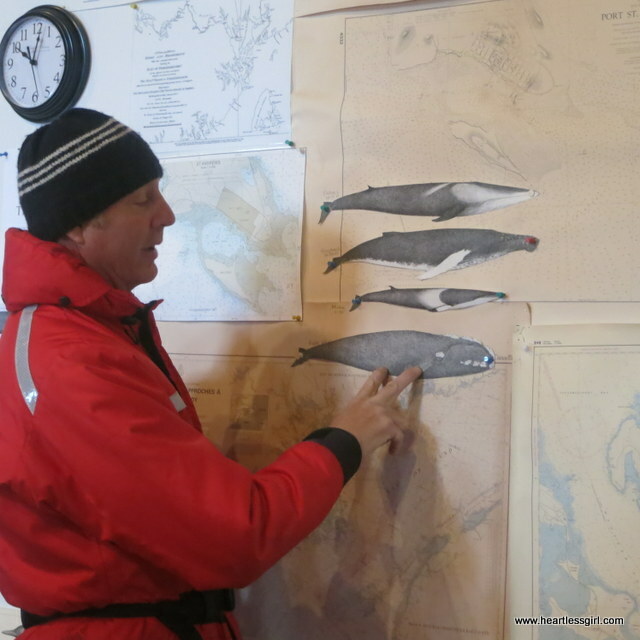 To read more about my visit to the beautiful New Brunswick, click here. The charming Rossmount Inn is a historic house with 18 rooms on 87 acres of land. 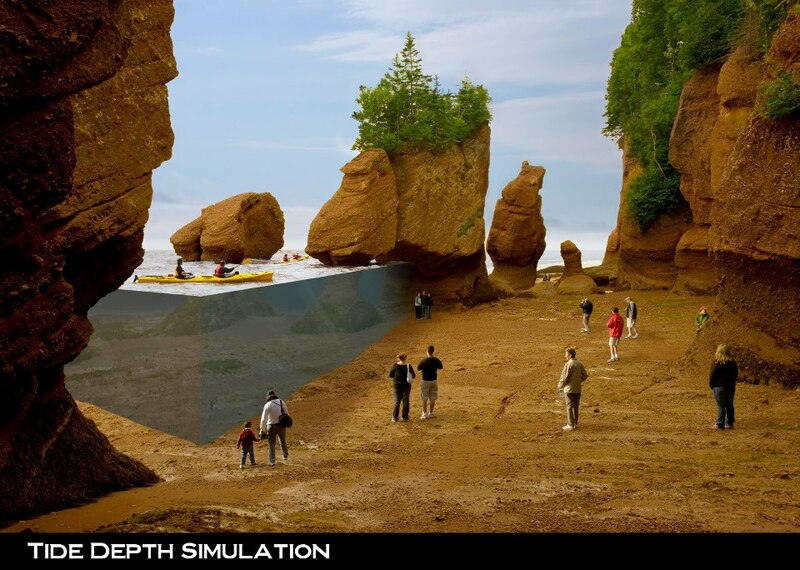 It’s just outside of St.Andrew’s, New Brunswick, and is known for its amazing meals. 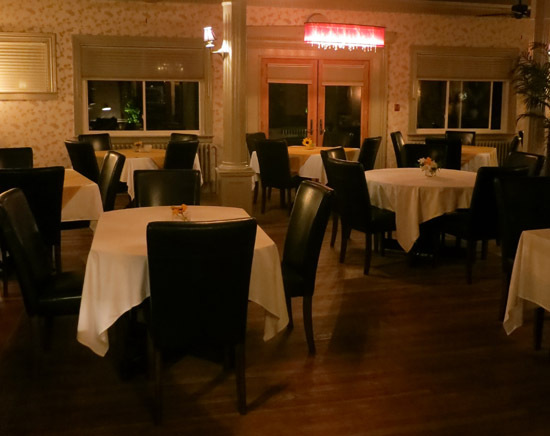 The Rossmount Inn is owned by Chef Chris Aerni and his wife Graziella. I was lucky enough to have a reservation here when I went to visit New Brunswick! 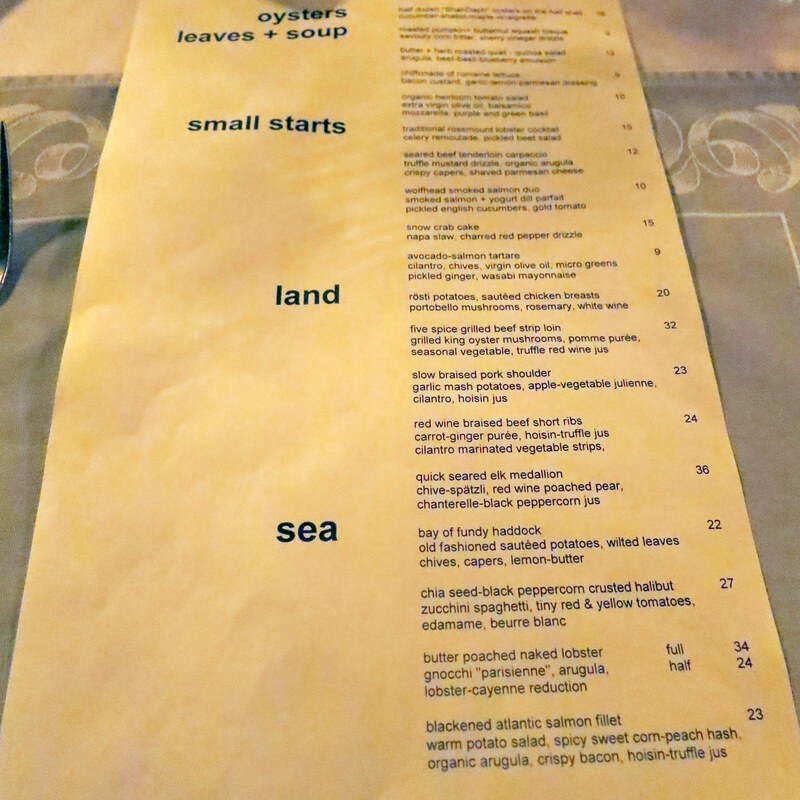 The menu sources locally caught fish, foraged greens as well as wild and organic foods. Because of this, the menu changes daily (this is what it was when I went). The dining room is intimate and pretty romantic. 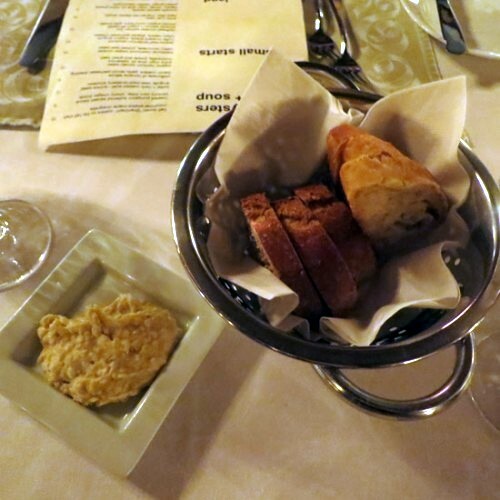 We started with homemade hummus and fresh warm bread. 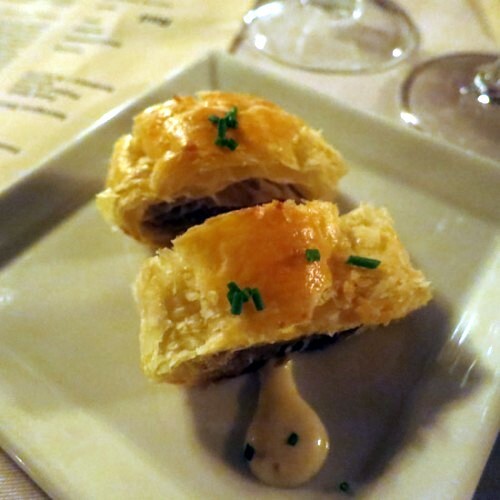 An amuse-bouche was brought to our table- tender beef wrapped in puff pastry. I had the Snow crab cake ($15) to start. 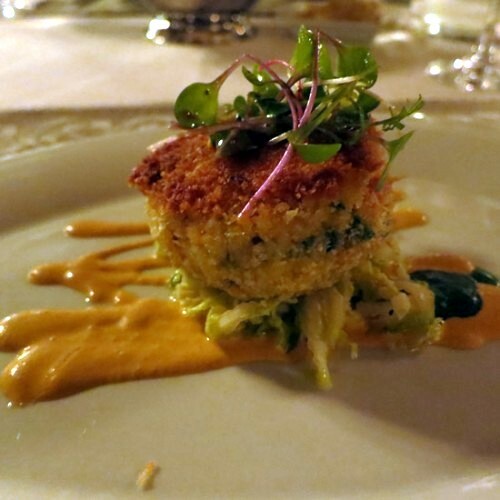 The fresh crab cake was served with Napa slaw and red pepper drizzle. The crab was sweet and was encrusted in crispy panko breading. Traditional Rosesmount Lobster Cocktail ($15) Fresh lobster with pickled beet salad and celery remoulade. Look at that presentation! We both really enjoyed our appetizers, and eagerly awaited our mains. We both had a hard time deciding what to eat. Since I was in Atlantic Canada, I knew that I wanted to eat as much lobster as humanly possible. That helped me narrow it down to the Butter Poached Naked Lobster with gnocchi “Parisienne”($24). I was worried that this meal would be too rich, but it was bang on for portion size. 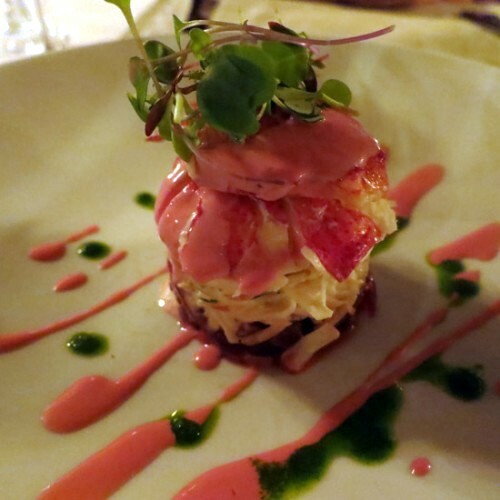 The dish had large pieces of buttery lobster garnished with arugula and lobster-cayenne reduction. 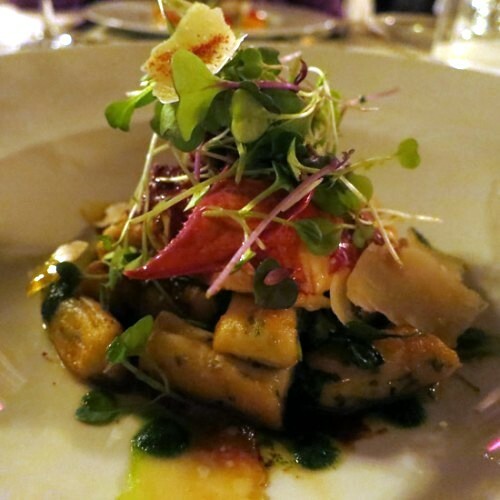 The star of the show was the Parisienne style gnocchi. While we were eating, Chef Chris Aerni actually came out to see how we were enjoying our meals. He explained that Parisienne style gnocchi is actually made from pâte à choux (the same stuff you make cream puffs from) and piped with a piping bag. They were so delicate, light, and packed with flavour. 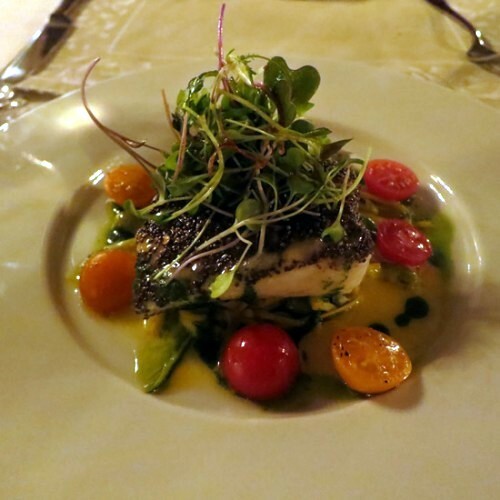 My dining partner had opted for the unique Chia Seed Black Peppercorn Crusted Halibut ($27). It was served with zucchini spaghetti, yellow and red tomatoes, edamame and white butter. What a combination! 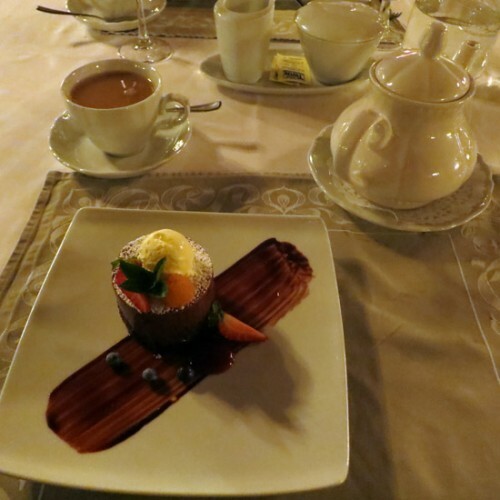 And of course, we had room for dessert and tea. 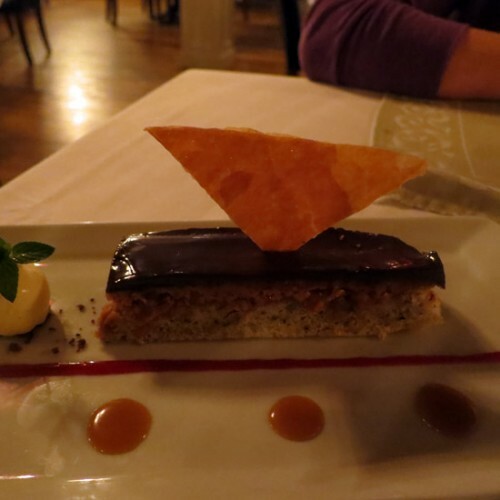 Hazelnut Slice ($9) with feuillete crunch, rich chocolate glaze and vanilla ice cream. The high quality of the food combined with the attention to detail in the ingredients and the beautiful plating makes it easy to see why reservations go quickly. I also thought that the price was quite reasonable for an upscale restaurant, compared to the prices in Toronto! If you are ever in St. Andrews, this is a must eat. 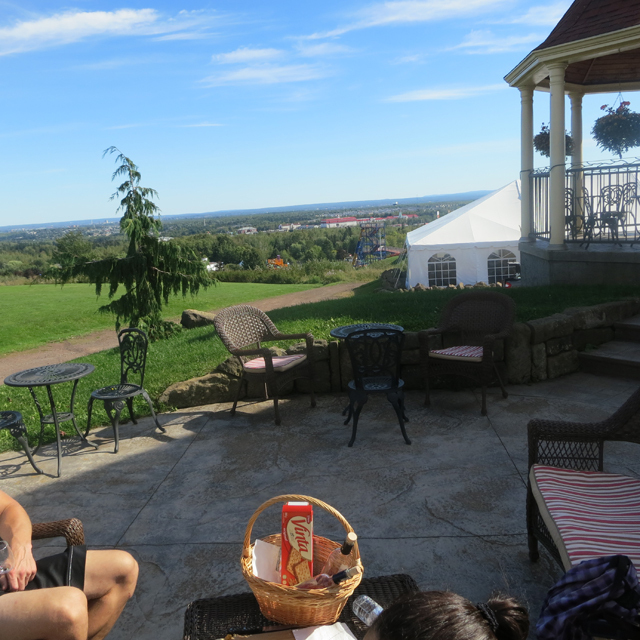 Just up the hill in Moncton is one of the most adorable wineries that you’ll ever see. This bright yellow house is not only part of the Magnetic Hill Winery, but you can also stay there at the Bed & Breakfast. The house was actually a beautiful 1867 estate home. Owners Jeff and Janet had a vision. They bought the home and put tons of work into lovingly restoring it. They raised the house and built another building directly underneath it to become the winery shop. 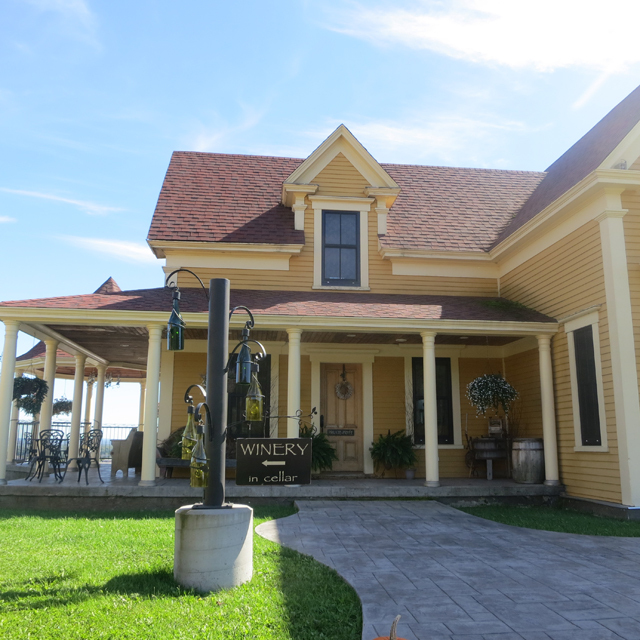 The winery has been open since 2005. 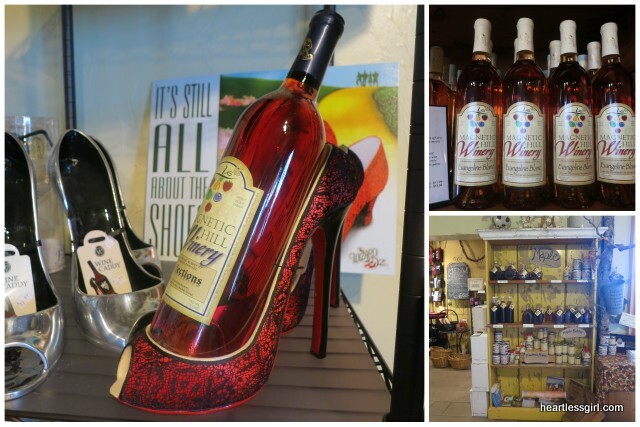 The shop itself is stuffed with tiny delights- like metal man wine bottle holders or giant high heel bottle holders. All of their wines use their hand-picked fruit and are fermented, filtered and bottled on site. 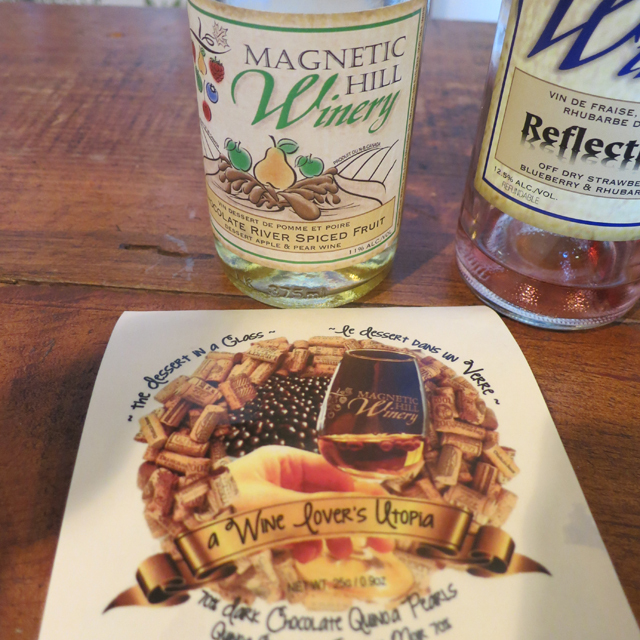 Stop by for a free tasting and experience some delicious fruit wines! We blind taste tested Illusions, their award winning white wine that was made using…wait for it…rhubarb! They grow and harvest the rhubarb for the wine. The wine was dry with a medium body and didn’t taste like rhubarb at all! 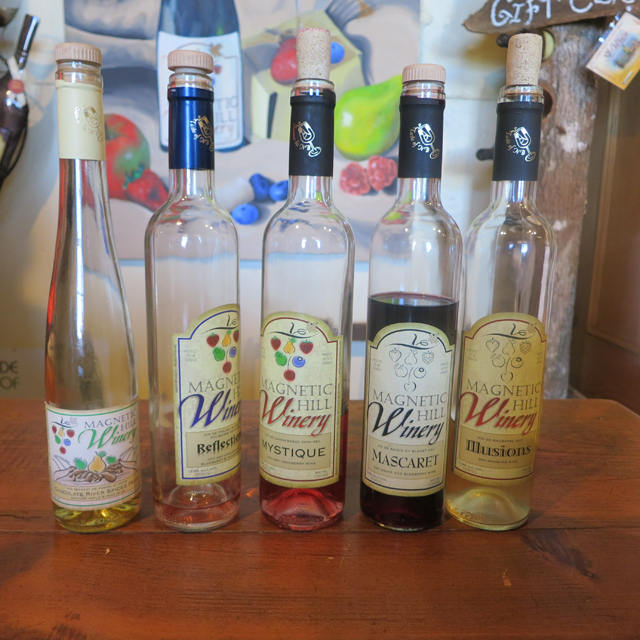 We also got to try a strawberry wine and a red blueberry wine. My favourite two wines were: Mystique: A cranberry wine with a sweet taste on the tongue that fades and leave you with a nice kick. I love it, because I prefer sweeter wines, but not -that- sweet. This wine is a 1 on the sweetness scale. 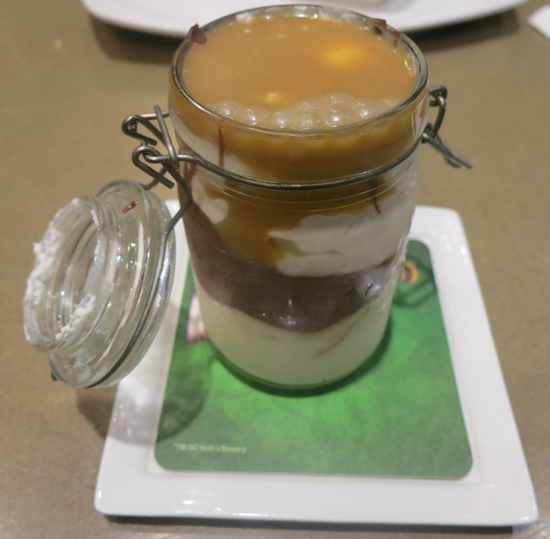 Speaking of sweet, my other favourite was the Chocolate River Spiced Fruit Wine. It was served in a fun way! We were invited to take a bit of chocolate covered puffed quinoa (yeah! delicious!). First, we took a sip of the sweet wine that had notes of blueberry and various spices. Then, we tasted the chocolate quinoa and the wine together- amazing! A fancy way to serve this dessert wine (a 5 on the sweetness scale) would be to put the quinoa in the glass and then pour wine over it. What a treat! This little wine shop has tons of personality and character. The owners have re-purposed parts of the original house that the bed and breakfast is now in. The old fashioned wooden insulation has been used to create one of a kind gift crates for gifts. The old windows and kitchen cupboards are used as displays in the shop. And the bright, buttercup yellow colour of the house? Inspired by the old kitchen cupboards. If you look up, you can see the original foundations of the house above you. Fancy a snack? You can purchase a picnic basket filled with cheese, crackers and wine to enjoy on the premises in while taking in the view. Best of all, the wine is affordable (prices range from $11- 15) and one of a kind. It makes a great gift! Click here to see all of the wine list. 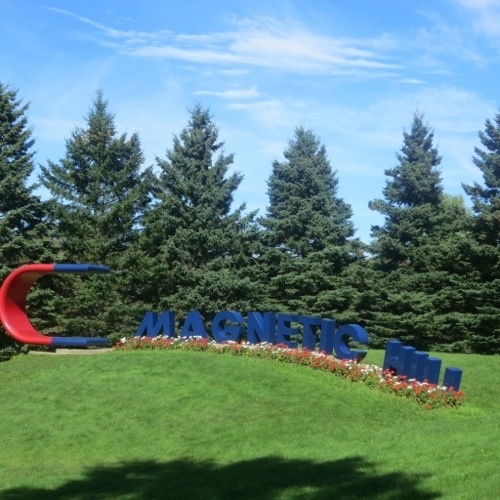 On a sunny day in Moncton, New Brunswick, we drove our car to Magnetic Hill and put the car in neutral. 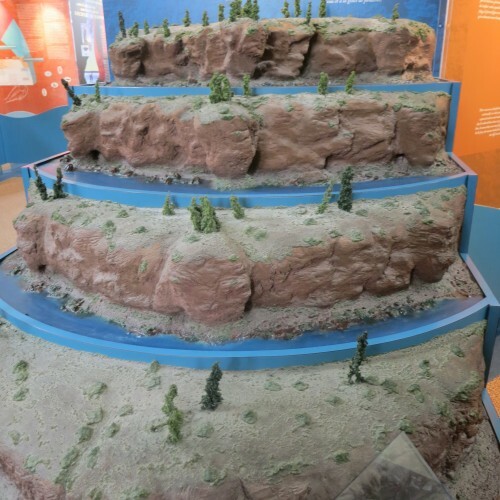 Magnetic Hill has been an attraction in Moncton for over 100 years! Way back in the 1880s, people were starting to notice that horses pulling carts would have the cart go up ahead of them. A little later on, cars would roll up the hill unexpectedly. This is how the hill got it’s reputation for being magnetic. 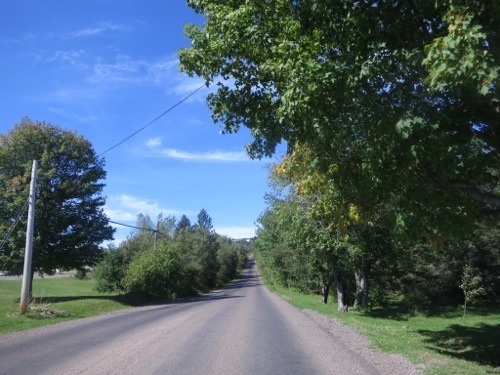 As it turns out, Magnetic Hill is a special type of hill called a Gravity Hill. I’m not going to ruin the magic, so I’ll leave it up to you to decide. Magnetic Hill…magnetic or magic? Magnetic Hill is in Moncton, New Brunswick. Click here for directions. 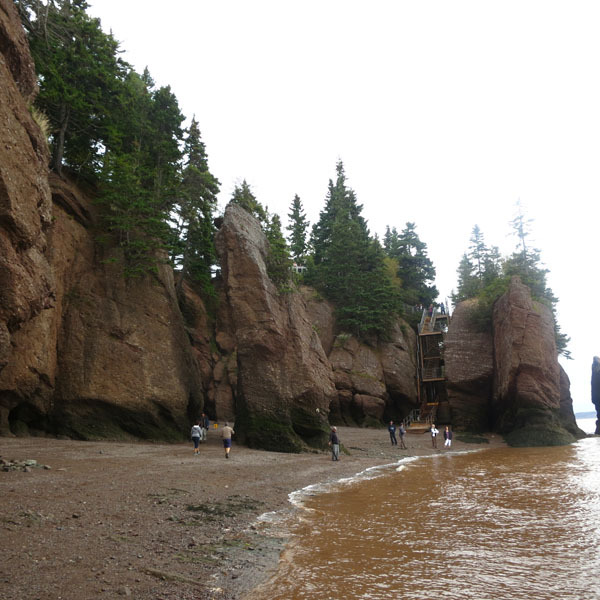 At Hopewell Rocks, in the Bay of Fundy, you can literally walk on the ocean floor at low tide. Tides here can reach up to 50 feet high two times a day! 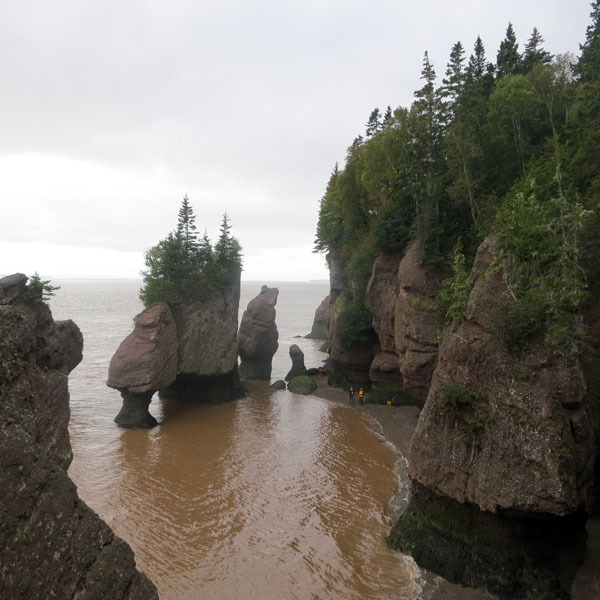 100 billion tonnes of sea water rushes into the the Bay of Fundy daily. 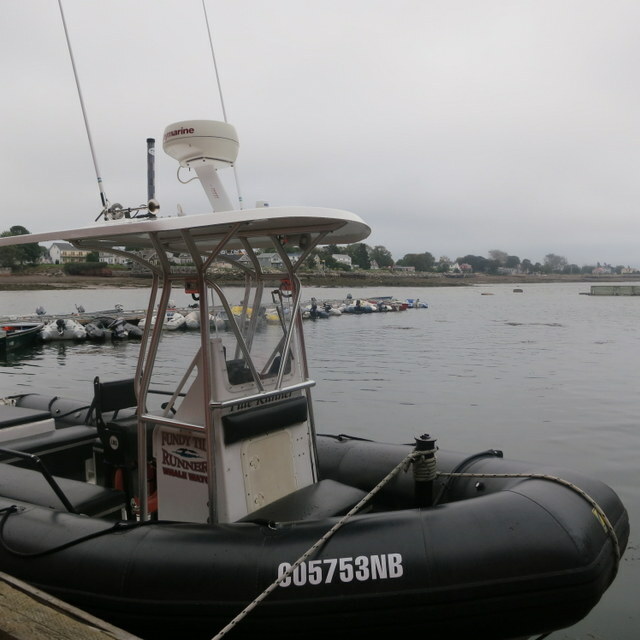 It’s about 6 hours between low and high tide, so you can experience both in one day. It took about 350 million years for these flowerpot rocks to be eroded by the waves into their current unique shapes. They are still unstable and large chunks occasionally tumble to the ground. We started off in the Interpretation Center. Here you can find life-sized sculptures of the rocks, and the science and legends behind the rocks. 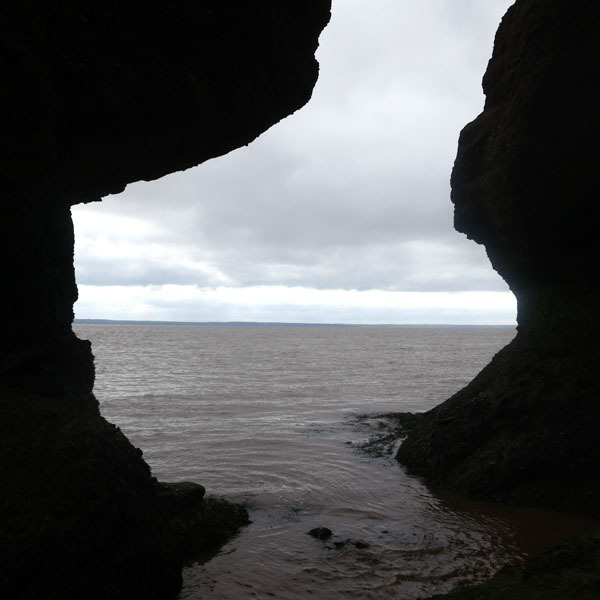 You’ll also learn about the Bay of Fundy geology, tides and see some videos. My favourite part was learning about the legends and lore of the rocks. There’s also a gift shop and a cafe that serves hot meals and drinks. 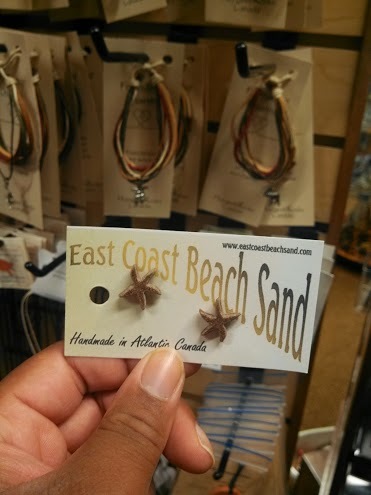 I got a cute pair of earrings in the gift shop! Next, head down to check out some of the viewing platforms and take a walk down to the rocks. If you don’t want to walk, you can buy a ticket for a shuttle. The rocks are huge! And beautiful. 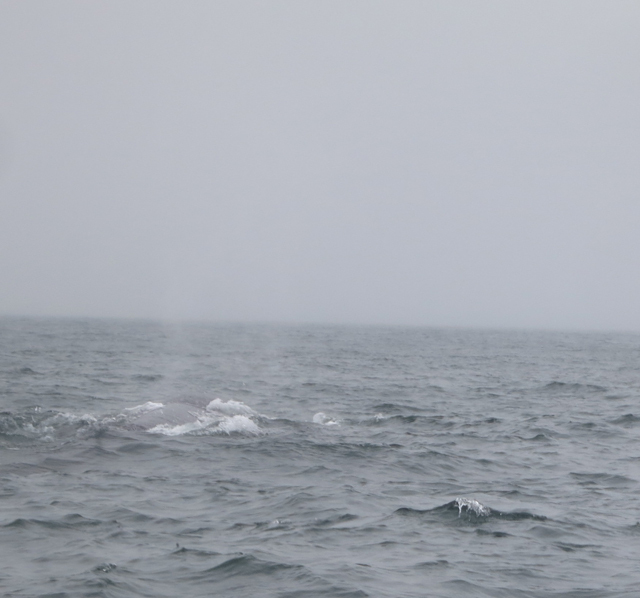 Unfortunately, we came by on a cloudy day. It was still amazing, though, and lots of people were visiting as well. The tide comes in fast and it can actually be quite dangerous if you are on the beach when the tide comes in. 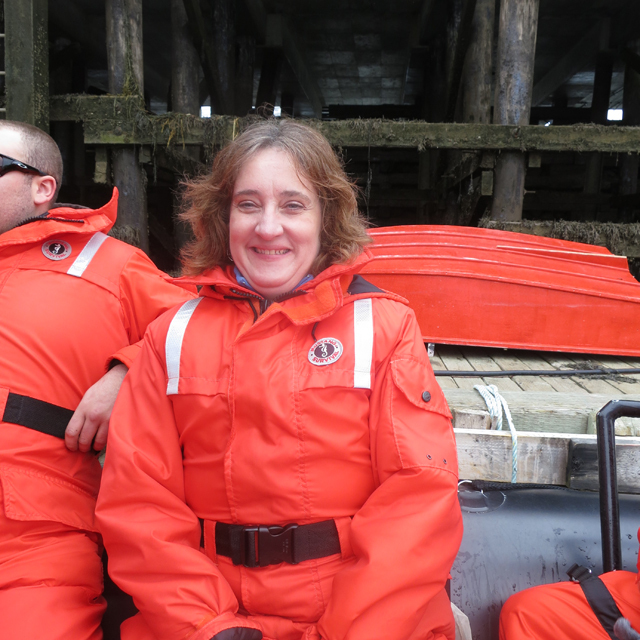 The staff work very hard to ensure everyone is off the beach when it’s time for high tide. Just while I was on the beach for about 15 minutes, I could see the water slowly but steadily rising. When the tide is up, if you are feeling adventurous you can go on a guided kayak adventure. If you come during the summer, you can see hundreds of nesting shorebirds, and there are lots of trails to walk down. The Hopewell Rocks are at 131 Discovery Rd. Hopewell Cape, New Brunswick.